Natural Health Practice PM Support is a very special formulation of three organic herbs, designed to help balance female hormones. It is effective for menstruating women between the ages of 18 and 50. It contains a combination of carefully chosen nutrients including all the B vitamins and magnesium (for nervous system), chromium (for normal blood sugar levels), Siberian ginseng (for adrenal support), chamomile (for nervous system) and dandelion (for liver support). 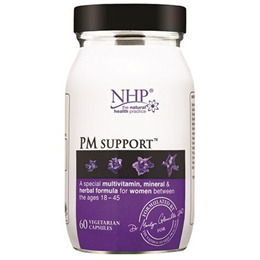 PM Support includes vitamin B6 which can contribute to the regulation of hormonal activity and reduction of tiredness and fatigue. Take PM Support and take back control of your life and cycle. 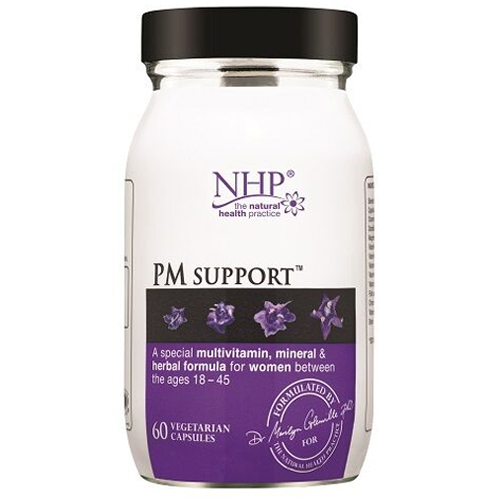 PM Support is free from gluten, yeast and dairy products. It is made without the use of artificial flavours, colours or preservatives, it is Kosher and approved by the Vegetarian Society. Siberian Ginseng, , Chamomile, Dandelion Root, Magnesium (Citrate), Vitamin B3 (Nicotinamide), Vitamin B1 (Thiamin), Vitamin (Pyridoxal-5-Phosphate), Vitamin B5 (Calcium Pantothenate), Vitamin B2 (Riboflavin), Folic Acid (As Folacin), Chromium (Picolinate), Biotin, Vitamin B12 (Cyanocobalamin), Capsule Shell: Hydroxypropyl Methylcellulose. For best results take 2 capsules, daily with food. Below are reviews of Natural Health Practice PM Support - 60 Vegicaps by bodykind customers. If you have tried this product we'd love to hear what you think so please leave a review.